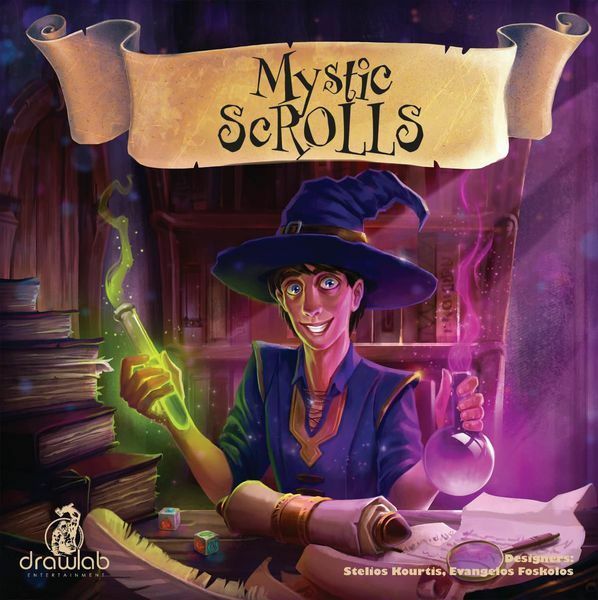 Mystic ScROLLS is a real-time dice game in which each player is a wizard trying to cast as many spells as possible to capture the mystic knowledge of the hidden scrolls. It plays for 2-4 players, 12 years old and up, and each game lasts around 20 minutes giving you a fun game filled with adrenaline. Each wizard has his own spells and begins the round with 5 magic dice. When the players are ready, we draw a new scroll card at the middle of the table and the round begins! During the round, the players are rolling their dice as fast as possible, trying to match the symbols rolled with the symbols depicted on their spell cards to perform the spell, or in the middle scroll card to claim and cast it. Players can reroll their dice as much as they wish in order to roll the desired symbols, performing more spells the faster they play. 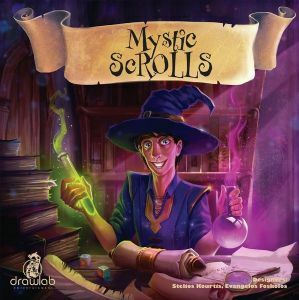 If a player rolls dice matching the requirements of a spell he places the dice upon the spell and immediately receives new dice from the dice pool. When the dice pool is empty or when a player claims the scroll card the round ends and all the spells are being cast.